Sulfuric Acid Storage Tanks are manufactured from HDPE, XLPE, FRP, and Carbon Steel at 1.9 specific gravity. Secondary containment is required. H₂SO₄ is best stored out of direct sunlight. Tank capacities range from 35 to 100,000 gallons. Prices range from $300 to $150,000. Sulfuric acid is a widely produced, corrosive inorganic acid that is used across a range of industries. The chemical formula for the acid is H₂SO₄. H₂SO₄ is a diprotic, strong mineral acid that is considered "weighty" due to its high density. Chemical solutions of sulfuric acid are very reactive and express true hazards that must be considered whenever handling and storing. Known most commonly as sulfuric acid, H₂SO₄ is also known as Sulphuric Acid (English spelling variant), and as battery acid or dihydrogen sulfate. Names no longer commonly used include Sulphine Acid and Oil of Vitriol. Conventionally, solutions are not 100% H₂SO₄ but are diluted to an extent with water and reported in weight percent (wt%). Common commercial strengths are 93 wt%, 96 wt%, and 98.5 wt%. Many customers purchase diluted sulfuric acid, typically at 70 wt% or 50 wt% strength. The handling, storage, and reactivity considerations of diluted sulfuric acid are quite different from those of concentrated products. Sulfuric acid is an odorless, semi-oily liquid that ranges in appearance from clear to yellow depending upon solution purity, where pure solutions are colorless. H₂SO₄ has a viscosity greater than water, which contributes to its characterization as an oily solution. The viscosity measurement for H₂SO₄ is 24.2cp (centipoise; 1cp = 1mPas) at 68°F (20°C). Comparatively, water is 1.0cp and olive oil is 85cp. Viscosity has an indirect correlation with temperature: as temperatures increase, viscosity decreases. The increased viscosity of H2SO4 can be attributed to the its internal resistance to flow based upon the molecular, three-dimensional structural orientation and the electrical-attraction of its atomic constituents; that is, polar dipole moments and increased hydrogen bonding. Commonly characterized as a "heavy" chemical solution because of its high density, which is dependent upon a specific solution's concentration. Density can range from 1.07 to 1.84 g/cm3, (where water = 1.0 g/cm3), making H2SO4 on its most dense side almost twice as heavy as water when occupying the same volume. Sulfuric acid is capable of dangerous reactions and is hazardous to human health. The chemical is a strong acid due to the high dissociation constant of the first hydrogen released in reactions. Sulfuric acid is a potent oxidizer capable of oxidizing certain chemicals and materials, such as some metals, and has great affinity and reactivity with water. The reactivity between sulfuric acid and water is exothermic (heat-generating) and is so great that the reaction can be incredibly violent and consequently hazardous, especially with strengths greater than 80% H₂SO₄. This exothermic reaction warrants important consideration in storage applications as the diluting or mixing of sulfuric acid with water or other chemicals can generate sizeable amounts of heat and can potentially warm the solution to levels hazardous to the storage container or associated equipment. How Should Sulfuric Acid Be Stored? Sulfuric acid must be stored in specific containers made of corrosion-resistant materials that will ensure the safety, stability, and longevity of the storage tank. These considerations can change depending upon the H₂SO₄ solution's specific concentration. If not stored in proper containers with correct fittings and gaskets, corrosion can occur and the tank structural-integrity compromised, which can cause a containment breach leading to potentially significant safety concerns and costly repairs. When evaluating storage containers, whether mixing or diluting of H₂SO₄ solutions will occur must be also be considered due to the exothermic reaction that can take place. Sulfuric acid should be stored in a cool, dry area away from direct sunlight, heat, and ignition sources, and that is separate from incompatible materials. Bulk storage of H₂SO₄ must employ secondary containment measures to satisfactory mitigate exposure concerns in the event of a bulk material release. A regular tank inspection and maintenance schedule should be employed for successful sulfuric acid storage. There are various considerations to be made when storing bulk quantities of sulfuric acid. Chemical concentration and volume are among the greatest concerns due to chemical weight-stress and the potential for corrosive activity to occur to the holding tank. Engineering review is recommended when storing greater than 4,000 gallons of concentrated sulfuric acid due to the increased weight load, tank stress, and hazards given a potential release. The following sections detail the most common bulk storage solutions for sulfuric acid. Carbon steel H2SO4 tanks are the common tank choice for storing bulk quantities above 10,000 gallons. Carbon steel tanks are reported to be most effective at storing high-end, concentrated sulfuric acid solutions of 93 wt% and above. This is due to increasing solution water content with decreasing H₂SO₄ concentration, allowing greater reactivity to occur between the acid and the steel storage tank. The water content of any concentration below 93% will allow for an increase in corrosive activity on carbon steel storage tanks. With this considered, carbon steel tanks down to 77% H₂SO₄ are still successful in acid storage. Temperatures should be maintained beneath 100ᵒF. Despite being a compatible material, sulfuric acid at the recommended concentrations and normal temperatures will still cause gradual corrosion. Regular tank inspections and maintenance are important for maintaining carbon steel sulfuric acid tanks. Of additional storage concern, this reactivity between the carbon steel and H₂SO₄ can generate hydrogen gas and iron sulfate. Hydrogen gas is flammable and buildup of the gas can be potentially explosive. Venting systems are a requirement for carbon steel and sulfuric acid to prevent the accumulation of hydrogen gas. Thermoplastics, such as PVC, are the recommended materials for sulfuric acid vents. Steel vents are not recommended due to the potential for iron sulfate production and buildup in the vent pipes. Iron sulfate is a precipitate formation that will settle within the sulfuric acid solution and tank systems. Buildup of iron sulfate is a purity problem and accumulation can cause problems in piping runs or pumps. The most common containers used for storing sulfuric acid solution quantities less than 10,000 gallons are high-density polyethylene (HDPE) tanks. Due to the increased density of H₂SO₄ solutions, only tanks with specific gravity ratings of 1.9 or higher are recommended for sulfuric acid storage in order for the tank to properly withstand the chemical weight. A benefit of using thermoplastics such as poly tanks for sulfuric acid storage is that such materials are not reactive with H2SO4 as the metal of carbon steel tanks are and so the production of hydrogen gas and iron sulfate is avoided. Cross-linked polyethylene (XLPE) tanks are not recommended for sulfuric acid storage. This recommendation is especially held for strong H₂SO₄ concentrations due to studies indicated XLPE failure after 6 months of storing 98% H₂SO₄, even at decreased temperatures of -40ᵒF. HDPE tanks are successful in the storage of sulfuric acid. Snyder Industries recommends that HDPE poly tanks be formulated using #880046 resins with CPVC fittings, Viton gaskets, and bolts of Hastelloy construction. The maximum service temperature of HDPE tanks peaks around 130ᵒF. This is important in H2SO4 applications as diluting or mixing of concentrated acid can drive temperatures up to and beyond this range. Due to these concerns with elevated temperatures, diluting concentrated sulfuric acid in plastic storage tanks is not generally recommended except under stringent engineering controls, methods, and mechanisms that allow it to be performed successfully. It is recommended to buy pre-diluted H₂SO₄ if less-concentrated solutions are required. 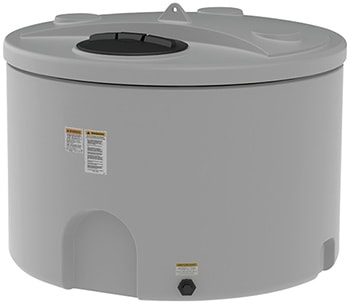 Polyethylene tanks for outdoor H₂SO₄ storage are recommended to be formulated with UV-stabilizers or insulated to aid in tank integrity and service life. Request a quote for a sulfuric acid tank or contact us for more information. FRP composite tanks are only recommended for sulfuric acid concentrations of 80 wt% or lower, according to FRP-resin producer Ashland, Inc. This storage type is not considered suitable to store more concentrated H₂SO₄ solutions. Strengths in excess of 80% begin to detrimentally corrode vinyl ester resins of FRP composite tanks. This is especially true should solution temperatures become elevated to 100-120ᵒF and above, which is of potentially great concern should dilution of H₂SO₄ be a consideration. Adding water to sulfuric acid produces significant heat and if temperatures rise above applicable thresholds, tank structural stability may become compromised. Due to these concerns, diluting sulfuric acid in fiberglass reinforced plastic tanks is not recommended. An engineering review should be conducted when storing in excess of 4,000 gallons of ≥ 94% H₂SO₄ (i.e. concentrated sulfuric acid). All sulfuric acid tank systems must maintain capable secondary containment measures. Common containment for bulk H2SO4 is through concrete diking with an acid-resistant coating, as concrete will react with the sulfuric acid. Engineering safety protocols require that secondary containment be capable of retaining at least 110% of the tank system total volume. This means for all tanks located within the designated containment area. Local regulatory statutes and codes may place additional requirements upon H2SO4 secondary containment systems. Always verify chemical storage systems are designed and maintained according to local regulating law codes. As with many chemicals, specific gravity and freezing point characteristics vary with concentration. Specific gravity will vary slightly dependent upon temperature as well. The following is a compilation of specific gravity and freezing point data for different H2SO4 concentrations. Specific gravity was measured at a solution temperature of 60ᵒF; note some approximations have been made. The freezing point of different sulfuric acid concentrations can vary markedly. 93 wt% sulfuric acid has a freezing point below zero at -21ᵒF, so many industrial applications can utilize carbon steel tanks with 93 wt% H2SO4 uninsulated, but 98 wt% freezes at 30ᵒF and so much more care is needed for successful storage. Between the sulfuric acid concentrations of 35 - 75 wt%, freezing is generally not a storage issue, and then the 93 wt%. For all other concentrations of sulfuric acid, a review of the chemical's freezing point data is recommended. Depending upon sulfuric acid tank location, whether outside or inside and ambient geographical conditions, the varying freezing points for H2SO4 solutions can present problems in applications. If exposure of particular H2SO4 solutions to temperatures near its respective freezing point are expected, heating and insulation of tanks and piping, as applicable, are recommended or required to prevent freezing. Upon mixing of sulfuric acid with other chemicals or diluting with water, a significant exothermic reaction can take place. The amount of energy generated is enough to raise the temperature of the solution considerably, as in the case of water. This heating of solution can cause damage to storage tanks, components, piping and related equipment if the heat is not dissipated correctly or if the reaction is not controlled. Whenever diluting with water, concentrated acid must always be added to water. Never add water to concentrated acid. The acid reacts with water and the temperature increase is significant, quickly producing a potentially hazardous situation. Even with adding acid to water, solution temperatures may rise beyond temperature thresholds. Threshold temperatures are reported storage tank and associated equipment values where damage begins to be incurred. If dilution must be done, a proper engineering review should be performed. If possible, purchasing pre-diluted sulfuric acid is recommended to avoid this problem. The following graph is a guide for determining final solution temperatures when diluting various H2SO4 concentrations with water at various temperatures. The graph can also be used to approximate the energy required to dissipate the heat energy generated from the reaction. The graph is only applicable when diluting sulfuric acid in water. Needed information: concentration and temperature of sulfuric acid solution to be diluted and temperature of the water used in the dilution. The following example demonstrates how to properly use the sulfuric acid enthalpy concentration diagram. In this example: 93 wt% sulfuric acid at 50ᵒC will be diluted in water at 30ᵒC to a final concentration of 70 wt% H2SO4. To determine the final temperature of the diluted acid: Connect the point where 93 wt% H2SO4 crosses the 50ᵒC temperature line (Point 1 on Graph) and where water (0% H2SO4) crosses the 30ᵒC temperature line (Point 2). The final temperature of the diluted acid, 70 wt% in this case, is indicated by where the temperature line is intersected by 70% H2SO4 (Point 3), which is approximately 150ᵒC. To determine the amount of heat dissipation energy required to decrease the final temperature to a desired temperature: Measure the difference along the y-axis (kilocalorie/kilogram solution) from the final solution temperature (Point 3) to where 70% H2SO4 crosses the desired temperature. In this example, the desired temperature chosen was 50ᵒC (Point 4). The result is approximately 55 kcal/kg. (Note: 1 kcal = 4.184 kilojoule). Sulfuric acid is a diprotic acid with an acid-dissociation equilibrium constant greater than many other common acids. Other H2SO4 characteristics include a hygroscopic nature, increased reactivity potential, very low pH for strong solutions, and various chemical incompatibilities. A diprotic acid, by definition, is a molecule that has two hydrogen atoms (two protons - hence diprotic) that are capable of being donated in a reaction from one chemical compound to another, which effectively alters the recipient chemical’s structure, reactivity, and general characteristics. This donation of protons in an acid-base reaction is directly associated with a molecule's dissociation constant - its Ka value. Higher Ka values for particular molecules implicates a more rapid dissociation of the proton from the parent acid for its reactive use with the reactant chemical. Higher Ka values causes the molecular equilibrium to more greatly favor the loss. 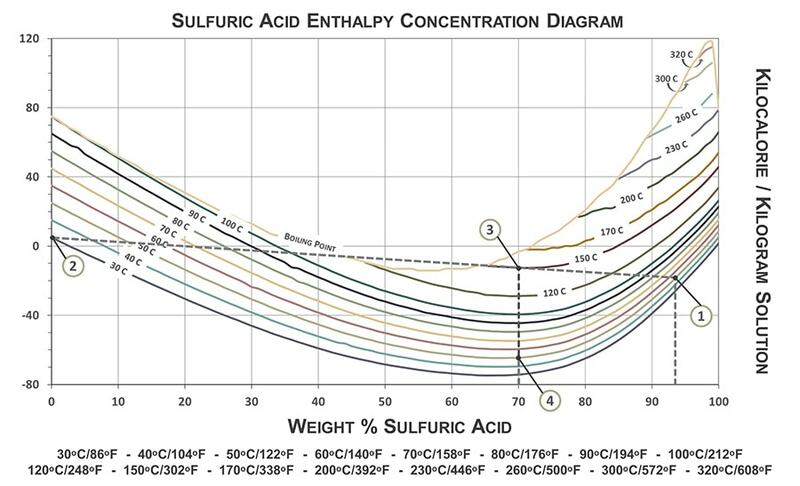 The comparison demonstrates sulfuric acid’s Ka values are significantly greater than other common acids—excluding HCl—and by several orders of magnitude in some cases. Sulfuric acid’s high Ka value makes it a strong acid for reactions and function very effectively as a buffer against pH change. Regarding sulfuric acid's reactivity and chemical considerations, the elevated Ka value contributes to hazardous situations that can arise. Perhaps the most evident of this is the reaction between concentrated H2SO4 and water. There is age-old adage about adding concentrated H2SO4 to water, which is to never add water to concentrated sulfuric acid due to the potentially violent exothermic reaction that can occur. The heat of reaction from adding water to concentrated H2SO4 is so great that it can cause a rapid increase in solution temperature where the result can be a very hazardous explosion of heated, concentrated sulfuric acid. This dangerous reaction is reserved for concentrated H2SO4 solutions and is considered mostly negligible for acid concentrations beneath 80%. Sulfuric acid has such a pronounced affinity for water that H2SO4 can dehydrate substances by effectively drawing out the water molecules found within chemical structures. Common demonstrations of this are H2SO4 removing water from sugar molecules to leave only the carbon skeleton of the previous polysaccharide chain and the burning/charring effect sulfuric acid can have on paper and the human skin due to tissue dehydration. Sulfuric acid’s ability to burn/char is in addition to the corrosive damage it can cause, contributing to the acid’s safety hazards. Sulfuric acid, as a chemical compound, is very stable. H2SO4 is considered to last indefinitely without degrading, breaking down, and without losing its strength or chemical characteristics when stored by itself. The chemical is not considered to be sensitive to the effects of the sun's ultraviolet energy. Sulfuric acid is incompatible with a list of materials and chemicals, some of which are common within industrial settings or applications. Sulfuric acid is considered incompatible with water if water is added to concentrated H2SO4. (Always add concentrated acid to water.) Sulfuric acid should not be readily mixed with the alkalis - caustic soda, caustic potash, soda ask, lime, and limestone. Sodium hypochlorite (bleach) reacts with H2SO4 to yield chlorine gas (Cl2), which is hazardous. Hydrochloric acid (muriatic acid) is incompatible, and nitric acid should not be mixed with strong sulfuric acid. The following is a short list of some other known chemicals incompatible with sulfuric acid. H2SO4 can react violently with bromine pentafluoride, nitroaryl amines, hexalithium disilicide, cyclopentadiene, cyclopentanone oxime, and phosphorous(III) oxide. H2SO4 is considered extremely hazardous with halides, carbides, nitrates, picrates, cyanides, chlorates, permanganates, azides, nitromethane, and zinc salts. An explosive reaction may occur when mixed with para-nitrotoluene, potassium permanganate, and water when H2SO4 is concentrated. Solution temperature and container pressure are known to increase when mixed with acetonitrile, hydrochloric acid, hydrofluoric acid, sodium hydroxide, propylene oxide, ethylene diamine, ammonium hydroxide, aniline, acrolein, and 2-aminoethanol. Any concentration of sulfuric acid other than 100% pure H2SO4 will react with certain metals to produce flammable and potentially explosive hydrogen gas. Common metals known for this reactivity are sodium, potassium, magnesium, calcium, iron, nickel, and zinc. The incompatibility of iron, nickel, and zinc is very important when considering storage, transport, and piping of sulfuric acid as the reaction displaces hydrogen from H2SO4 releasing it as hydrogen gas and forming a metal sulfate salt. Water must be present for the reaction to occur, thus the unreactive nature of pure H2SO4. The reaction with zinc indicates galvanized piping should not be used for sulfuric acid. Some metals are known to be actively corroded by sulfuric acid, such as aluminum alloys and carbon steel, and the rate of corrosion will actually increase with more dilute concentrations of H2SO4 due to the increasing presence of water. For this reason, carbon steel tanks are not recommended for more dilute solutions and stainless steel bolts are not recommended when sulfuric acid is less than 93% concentration strength. See CAMEO Chemicals, a division of the National Oceanic and Atmospheric Administration (NOAA), for further H2SO4 reactivity considerations. How is Sulfuric Acid Used? The acidic solution composed of molecular H2SO4 has many industry applications across the world. Sulfuric acid is an acclaimed economically-important chemical that is effective in the production of agricultural products, vehicle batteries, adhesives, explosives, and other chemicals such as solvents, degreasers, soaps, dyes, and water treatment chemicals. Within the agricultural industry, its products and applications, sulfuric acid is an important component as it is used in the production of non-pesticidal chemicals such as phosphoric acid and phosphate fertilizers. 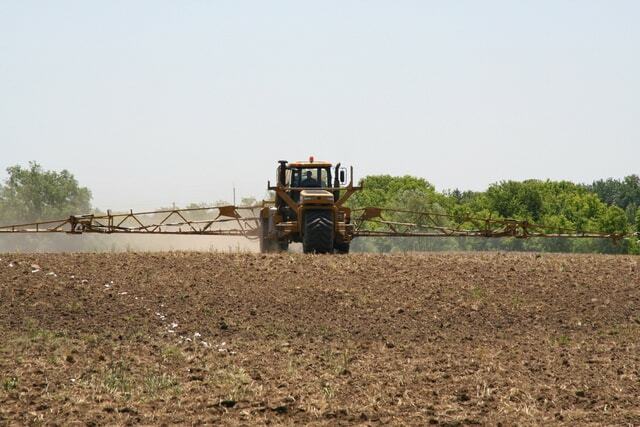 Ammonium sulfate and superphosphate of lime are fertilizer examples manufactured using sulfuric acid. Some countries utilize H2SO4’s dehydrating properties to function as a desiccant for crops like fruits, potatoes, flax, and certain plant bulbs. Another significant use of sulfuric acid is in the manufacture of lead-acid batteries, the type traditionally found in automobile engines. Within such batteries, sulfuric acid contributes to the inner electrolytic solution that drives the electrical gradient between the battery’s lead plates. 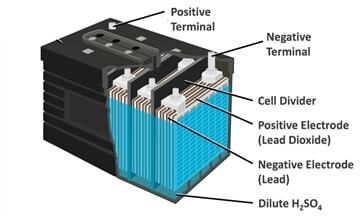 When charged, the negative-pole lead plate reacts with H2SO4 to generate lead(II) sulfate, a proton, and the electrons to drive both the electrical gradient and the reaction that occurs at the positive-pole plate of the lead-acid battery, providing the electrical current. H2SO4 solution concentrations used in lead-acid batteries are conventionally between 25% - 40% sulfuric acid in water. This dilute solution still presents an appreciable health hazard due to low pH values. The number of industries that utilize sulfuric acid in a variety of applications is long. Some examples include: pharmaceuticals, petroleum refining, manufacturers of cleaning products, agronomy and agro-science, metal processing, paper/wood processing, paint, pigments and ink, leather production, and ore processing. Some example applications of sulfuric acid: pH-adjusting agent, as a strong acid in acid-base reactions, oxidizing/reducing agent, propellant, solid-separation agent, process regulator, anti-scaling agent, and as a chemical catalyst or reagent. Sulfuric acid is also used in certain household products such as drain cleaners, laundry detergents, rust removers, cleaners and degreasers. Millions of tons of sulfuric acid are produced annually across the globe, with the United States and China ranking as the top manufacturers. Over 40 million tons are produced annually in the U.S. alone. The Contact Process—utilizing a catalyst—is the most common H2SO4 production method. 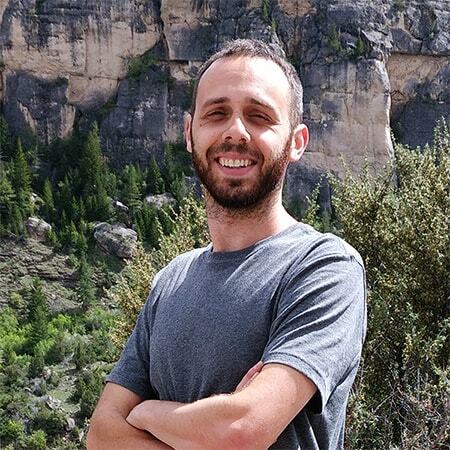 Other less common methods exist, and all the different processes hold potential variations in their execution. Step 1: Elemental sulfur, obtained through natural gas or oil, is burned in the presence of excess oxygen gas to form gaseous sulfur dioxide. Sometimes this step is replicated by heating sulfide ores, such as copper sulfide, nickel sulfide, or less-commonly, iron pyrite, in an excess of air to produce sulfur dioxide. 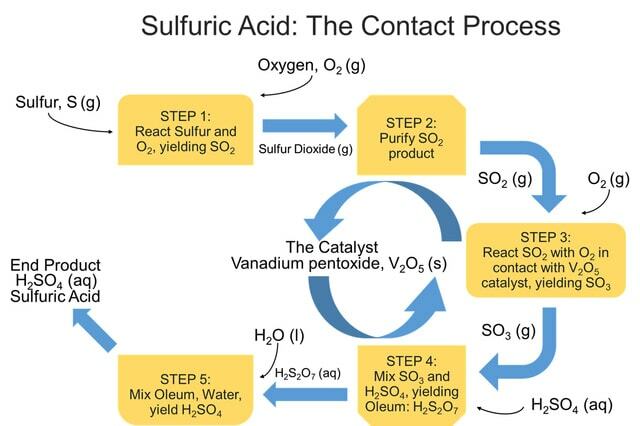 Step 2: The sulfur dioxide from Step 1 is purified to avoid poisoning the catalyst and render it ineffective to perform its catalytic abilities. Step 3: Sulfur dioxide and excess oxygen gas are reacted in the presence of the catalyst, vanadium pentoxide, V2O5, with elevated temperatures around 750-850°F, and held at pressures of 1-2 atmospheres to produce sulfur trioxide gas. Step 4: The gaseous sulfur trioxide is mixed with a concentrated sulfuric acid solution to produce liquid pyrosulfuric acid, H2S2O7, also known as oleum. Step 5: Oleum, H2S2O7, is reacted with water to yield the end product of concentrated sulfuric acid. Twice as much H2SO4 is produced as was used in Step 4. Prior to the Contact Process, the Lead Chamber Process was the main method for producing sulfuric acid for nearly two centuries, and the development of the Contact Process method largely replaced its usage. Other less common methods for H2SO4 production are the Wet Sulfuric Acid Process, the Metabisulfite Method, and dissolving sulfur dioxide in hydrogen peroxide. Concentrated sulfuric acid is highly corrosive, capable of causing severe-to-permanent tissue damage to eyes through blindness and to the skin through severe chemical burns. Severe exposures can be fatal. Inhalation hazards are reserved for circumstances where H2SO4 becomes heated and vapors may generate. Inhalation of H2SO4 can cause severe nose and throat irritation, corrosive effects on the pulmonary pathways, and can possibly lead to fatal pulmonary edema. Ingestion of sulfuric acid may cause severe burning and can lead to gastrointestinal ulcers—permanent damage or death can occur. Diluted sulfuric acid retains a pH around or less than 1.0 and according to mandated regulations, should still be handled as a corrosive with significant potential health hazards. It is important to note a very vital and highly reiterated fact, which is to always add concentrated acid to water and never add water to concentrated acid. When handling sulfuric acid, full personal protective equipment should be worn as outlined by supplier-provided Safety Data Sheets relevant to the specified H2SO4solution strengths. Always follow regulated safe-handling recommendations. Always communicate your needs and specifications directly with tank manufacturers whenever purchasing storage tanks for sulfuric acid. Acquire each individual manufacturer’s direct approval as maximum concentration ratings may differ between companies and as chemical solution-strengths can be reported in various ways. Regardless of how solution strength is being reported, always verify with tank manufacturers that their tanks and components can safely meet the desired conditions to maintain safe storage conditions for sulfuric acid tanks. Always follow federal safety guidelines whenever handling H2SO4, (see the CDC for safety information concerning 100% H2SO4 solutions). Sulfuric acid is a strongly acidic chemical highly utilized across various applications. Even when dilute, it is corrosive and dangerous. The chemical is stable by itself but bears the potential for very hazardous reactions with various chemicals and materials. When purchasing a storage container, the corrosive strength of sulfuric acid must be considered when choosing materials and secondary containment measures must be in place in the occurrence of a storage tank or component failure. Protank is a national supplier of Sulfuric Acid tanks nationwide. Contact our experts to discuss your sulfuric acid storage requirements.